This entry was posted in iPhoneography, Macro, Photo Challenge, Photography and tagged iPhone 5, iPhoneography, Lens and Pens by Sally, Macro, Photography. Wow lovely and soooooo teeny-tiny! They look like the night-blooming jasmine in our courtyard, but those are high in the sky! I always enjoy that Mother Nature produces such a variety of small wildflowers. I suppose teeny tiny insects find them. Nice discovery. Happy Photo Challenge. Thanks, Sally. I like that “teeny tiny insects!” Reminds me of the “Teeny Tiny” English fairytale! LOL! 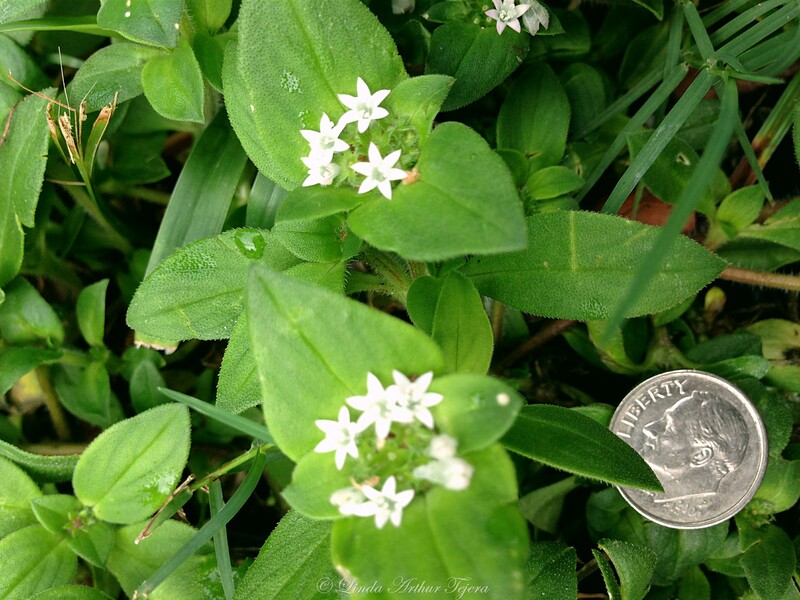 Such pretty flowers – so tiny and delicate. Teeny tiny but big on beautiful! very nice effect with snapseed. Lovely little flowers! Hi L – I like the snap seed version – what a Dainty flower! Well I have two photos of dimes that i hope to post about later – and want to connect it to a lady (from 2002) who said she knew God was trying the get her attention when she found a dime! Anyhow – I am sure u placed your dime there to show the macro- right? Hi, Y! Hope you’ve had a good week and are heading into a great weekend. I know you’re busy. Yep, the dime is for scale. 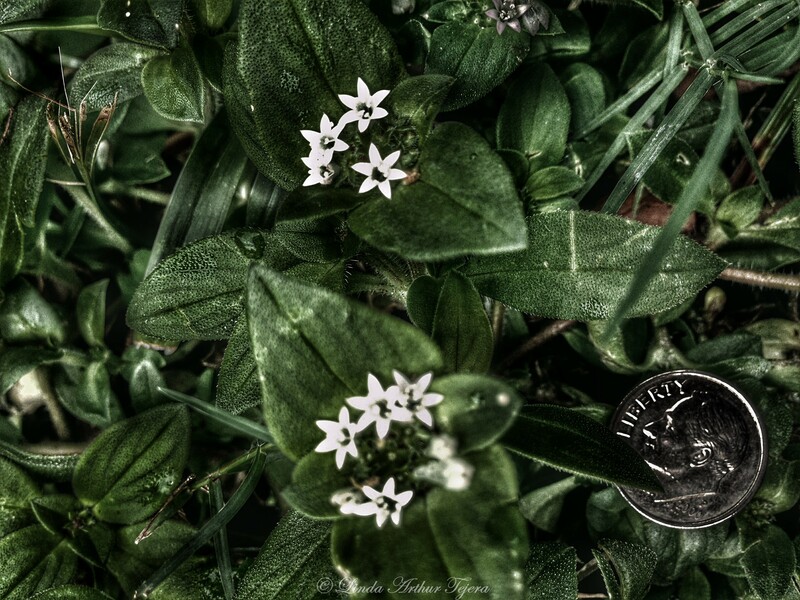 I couldn’t believe how tiny these perfect little flowers were. I’ll be looking for your “woman and the dime” post. It sounds intriguing! Gosh, that sounds like so much fun! And it certainly makes for great family memories! Glad you missed that mess in WV. I saw the headlines about all of the flooding but haven’t read it. Glad you all are safe and moving on! Thanks L! I will share more (but of course- ha!) and we think that if we were two hours later heading out we would not have made it thru – and oh wow – our hearts go out to the people who are suffering – feel so bad! The first is lovely, but I really like the intricacy you were able to show in the second photo. What is snapseed? I think the kitties’ dad would like to try that. That was a lucky find (the dime) or you placed it on purpose to give the sense of scale?